We shall see! I just finished foraging, (broccoli, apples, and a Cosi sandwich) and now I’m quick checking my email, making this post, checking the presidential polls and then I’m heading home. Hurricane Sandy did not make a dent into my poll addiction. 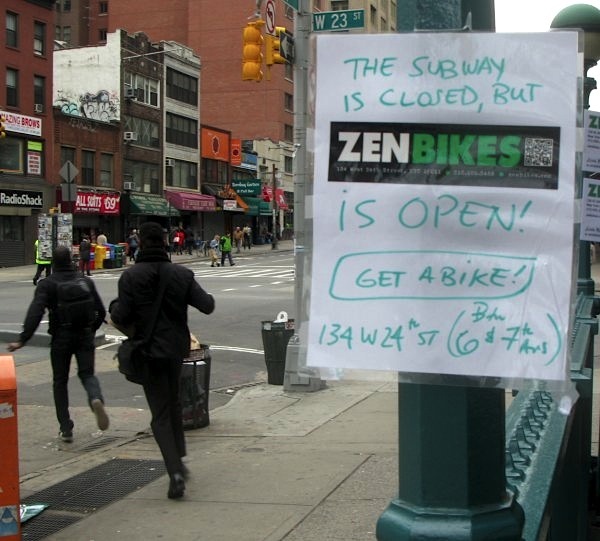 A enterprising bike shop puts up signs at the subway stops. A number of very kind businesses (and Con Ed) set up generators on the street and let anyone who came by power up. But this shop, a UPS store on 7th Avenue between 18th and 19th, gave out power AND CANDY. So a big thank you to UPS! I’ll bet it was the idea of the guy looking at the camera. He has such a sweet face. I hope the rumor of power comes true! It was kind of freaky not knowing where you were or what your status was for awhile there. I thought it was something with my computer when I couldn’t even get to your site. I’m glad to know that you’ve honed your foraging skills and you and your boys are faring pretty well. It is heart-warming to see what people will do to help others in these disaster situations. Keep the good stories and pics coming when you can. Take care! I “second” Betsy’s comment above! Yay to UPS and other generous businesses like them! Boo to the bad guys who see this as an opportunity to gouge desperate people. I hope there won’t be any of that going on. A book came out about 10 years ago with pictures taken during the Ice Storm of 1998 that hit Eastern Ontario, Quebec, Maine, northern New York and Nova Scotia. One of my favourite stories was about a car wash owner who opened his business to people who needed to come in for a hot shower. 150,000 customers in Quebec were still without power 3 weeks after the storm hit. In the dead of winter. Glad you made it through unscathed. Hate the huge ones. we’ve been lucky down here the last few seasons. Hope you and cats didn’t and will not have too many troubles. it seems like storms are getting larger and big cities are under threat.Let us get ready.